President Emmerson Mnangagwa was forced to abandon his trip to Abu Dhabi in the United Arab Emirates on Sunday after coming under pressure at home over the government's apparent lack of preparedness to deal with the aftermath of Cyclone Idai. At least 65 people are confirmed dead, and over 150 missing in Zimbabwe after the cyclone swept inland from Mozambique's coast, causing massive destruction in that country, parts of Malawi and most of eastern Zimbabwe. Mnangagwa has been criticised for flying off to Abu Dhabi on Saturday where he was seeking a financial bailout in the full knowledge that a cyclone was about to hit. "HE President Mnangagwa has shortened his visit to the UAE to make sure he is involved directly with the national response by way of relief to victims of cyclone Idai. President has also incorporated in his schedule a plea for assistance for the cyclone victims," the Ministry of Information said on Twitter. Jonathan Moyo, who was a minister in the government of ousted former leader Robert Mugabe, said on Twitter: "He should not have gone in the first place. As he was flying out, the cyclone was flying in. It's better to shorten his luxury trip than to shorten the lives of citizens, which he has vowed to do!" Political commentator Alex Magaisa blasted: "Cyclone warnings were given well in advance. Mitigation measures should have been taken. But they won't take responsibility. "What was Mnangagwa thinking as he got on the luxury jet to the UAE, knowing he was leaving stranded and desperate citizens in Manicaland? Wasn't he aware? Did he have to go to the Middle East to realise the magnitude of the disaster and that as the nation's leader he had to be home?" Vice President Constantino Chiwenga, who was Acting President in Mnangagwa's absence, issued a statement on Saturday night saying he wished to "assure the affected families and fellow Zimbabweans that the government is working round the clock to manage the unfolding disaster." Jacob Mafume, the Movement for Democratic Change spokesman, said a "serious humanitarian crisis (is) unfolding" in eastern Zimbabwe's districts. "We need state intervention on a massive scale to avoid biblical disaster," he said. Chimanimani East MP Joshua Sacco said he had confirmed 65 deaths, adding that rescue efforts were being hampered by damaged bridges and roads. Cyclone Idai has affected more than 1.5 million people in the three southern African countries, according to the United Nations. The cyclone battered central Mozambique on Friday killing at least 19 people there and cutting off more than half a million in Beira, one of the country's largest cities. Hardest hit is the central port city of Beira where the airport is closed, electricity is out and many homes have been destroyed. Homes, schools, businesses, hospitals and police stations have been destroyed by the cyclone. Thousands were marooned by the heavy flooding and, only caring for their lives, abandoned their possessions to seek safety on higher ground. Local officials in Mozambique said that heavy rains earlier in the week, before the cyclone struck, had already claimed another 66 lives, injured scores and displaced 17,000 people. Heavy downpours in neighbouring Malawi have affected almost a million people and claimed 56 lives there, according to the latest government toll. In Zimbabwe, at least 31 people have died from the floods so far, according to the government. The deaths are mainly in Chimanimani, a mountainous area along the eastern border with Mozambique that is popular with tourists. No tourist deaths were recorded, said government spokesman Nick Mangwana. Roads and bridges were swept away, slowing rescue efforts by the military, government agencies and non-governmental organisations, he said. Mangwana tried to reach Chimanimani by road on Sunday, but access was impassable after the tarred road got so saturated a bus sunk its wheels, blocking the road. Elsewhere, journalists reported fallen huge trees and boulders from mountain mudslides from blocking roads. 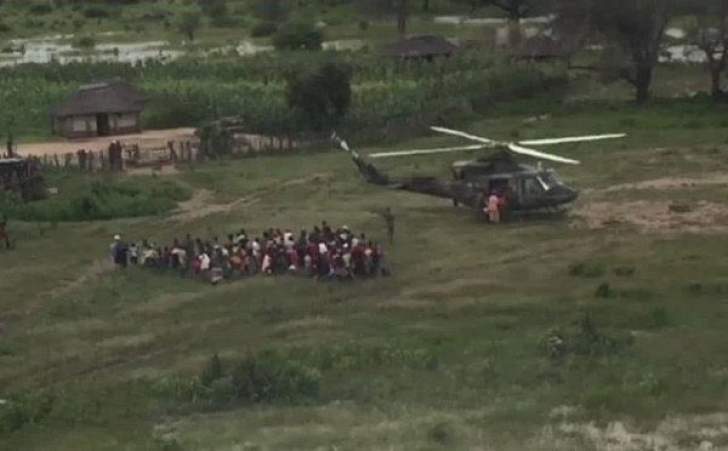 Local officials said a helicopter provided by the military was failing to access marooned villagers due to mist and strong winds, severely limiting the rescue effort.